The KLEIN-ALBERT company has been founded in Mulhouse in 1865 by Elise ALBERT. 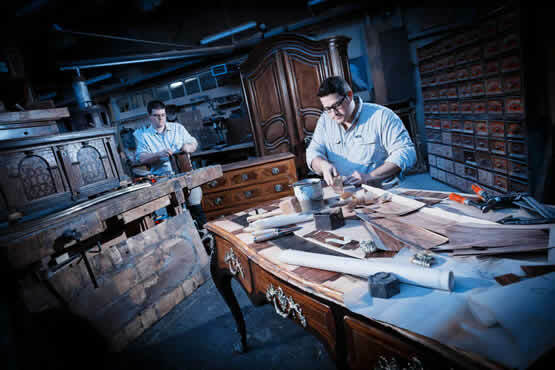 Bertrand Klein represents the fifth generation of cabinetmakers and once decided to transform the woodworking workshop into a renovation one, specialized in the Alsatian furniture, Rhine renaissance inlays and cabinets of the XVIth century. 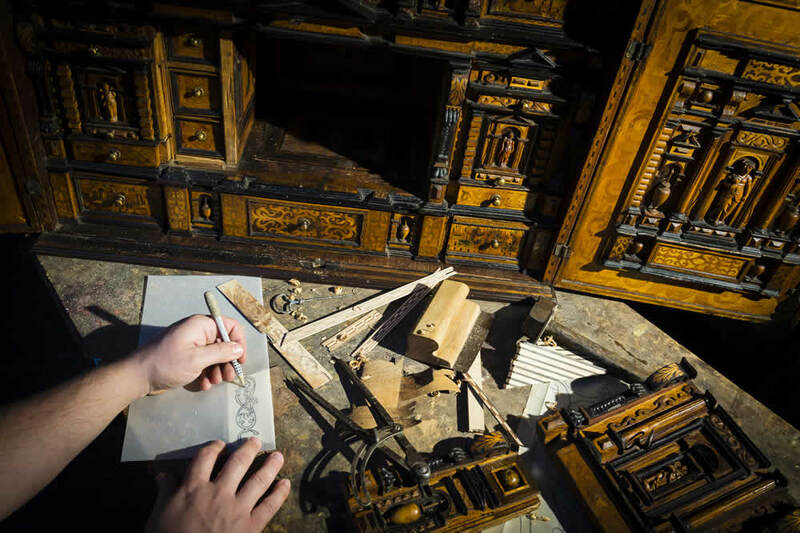 Several companions have their own field in which they work: carving, solid wood, inlay, locksmithing, French varnishing, polishing in order to give a second life to collectible pieces that have the merit of having reached our workshops crossing centuries. After his item has been selected in its original state, the art amateur will have to opportunity to be aware about the evolution of its restoration. The workshop is able to propose restoration services in order to give a second life to personal furniture on which the marks of time are visible. Our restoration work consists in the removal of old veneer dismantling of frames, the careful stripping of old varnish, the restoration of lacks by thoroughly choosing between many different wood species elements the most adapted one by its veining. Other actions are also made, such as fungicidal and insecticidal treatments, color embellishment, stamped polishing, fittings and oxidized steel scraping, chiseled bronzes polishing and gilding, leather pose with golden vignettes, paintings and canvas washing and varnishing. Every facet of conservation will be taken into account in our workshop. The company bears special interest to columns wardrobes inlaid with geometrical and floral patterns, XVIIIth century commodes, extraordinary adorned Augsbourg cabinets and furniture from the XIXth with thin rowing veneer. Our companions and upholsterers thin out ancient seats, disassemble and renovate seats frame. After assembling them and bringing stamp finishing, they garnish them by following the traditional way; webbing, springs and stuffing. Concerning the covering, you can choose between qualitative fabric from Pierre Frey, Casal, Nobilis, Sahco, etc. which will be finished with piping or patinated bronze nail. Concerning paintings restoration, a cleansing, relining, varnish enlightenment and conservation are proposed. The renovation of wood or golden stucco is also possible. To proceed to interior design projects you can contact Arnaud Klein architecture, graduated from the prestigious Ecole Camondo Paris. He will consider your wishes and will carefully mix ancient and contemporary elements in order to glamorize all your rooms. For hotels, restaurants and reception rooms, Pascale Klein will select special furniture with historical and industrial background, what will give original and personnalised atmosphere for exclusive places. Bertrand Klein Expert offers buyers and collectors all the needed guarantees for sales, purchases, expertise or sharing.